Elmer’s Glue needed a unique way to attach a bonus Washable Clear Glue to their 1-gallon jug of School Glue without hindering their original master carton boxes during the shipment. Do-It Corporation was able to provide a solution with a printed bottle neck hang tab. Do-It’s CEY Bottle Neck Hang Tab fits directly over the caps of both glue bottles, securing them in place. 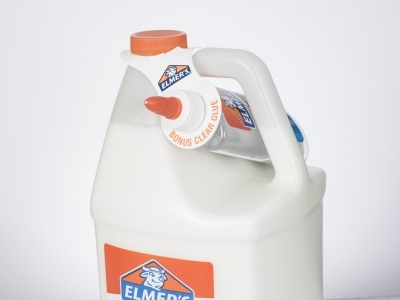 The bonus Clear Glue bottle tucks into the handle of the School Glue jug during shipment allowing Elmer’s to use their original master cartons. Once the glue jug is at its final destination, the bonus clear glue can easily be positioned for display. Additionally, the fully printed CEY reinforces Elmer’s Glue branding message.